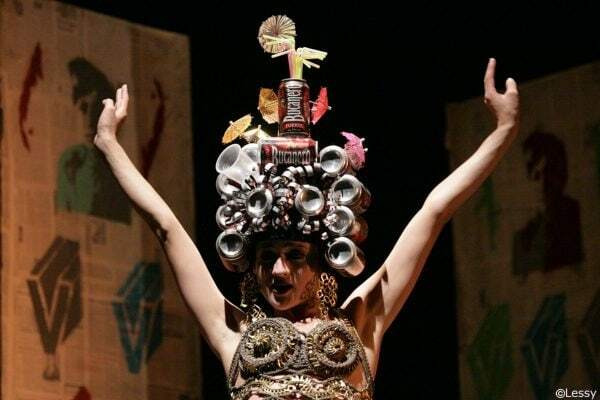 Loren Noveck reviews a Cuban retelling of Antigone by Havana’s Teatro El Público. Watching theater in a language you dimly understand (Spanish, in this case, with English supertitles) can produce a strange, disjunctive effect, where your comprehension of what’s being said lags behind what’s being seen and heard, like the gap between lightning and thunder from a distant storm. In the case of Antigonón, presented at Under the Radar Festival by the Cuban company Teatro El Público, the disjunct is heightened by the fierce energy of the performances, the striking visuals, and the fact that the heard poetic rhythms of the Spanish text don’t always translate into the supertitles. So while the show is dense with references, political themes, and allusions to Cuban history (which, beyond Antigone itself and one specifically referenced story of a Cuban revolutionary hero, Antonio Maceo, that almost eerily echoes the setup of Antigone with its need to retrieve corpses killed in battle, I’m sure I’m missing most of), it presents itself to memory in a series of images and a sense of urgency and excoriating rage conveyed so remarkably by all the performers. The piece isn’t narrative, but instead circles back and around a series of fragmentary stories linked by theme and image: war, specifically a tank battle; a decrepit and helpless but also dangerous old woman; the idea of homeland; the abuse of power; cows and monkeys; an overripe, almost dangerous sexual energy; the grotesquerie and power of the human body, especially the female body; questions of honor and violence and what duty we owe to our country, and what our country to us; the way the conditions of living in a time and place are etched on and seep into the body itself. There’s sexual grotesquerie as political act, and other political currents as well, more apparent but still hidden under layers of other meanings, not spoken clearly or out loud. But beyond those themes, we find a series of striking stage pictures. The piece begins with an extended, silent movement sequence featuring four fully naked performers moving in two pas de deuxs in shifting combinations. Sometimes the two women are dancing together, as are the two men; sometimes one of the women is carrying one of the men; sometimes the reverse. The choreography isn’t particularly elaborate, but the intimacy, power, and immediacy of the nakedness are unavoidable, intriguing, arousing, and disturbing all at once. In the next section, the two men remain mostly naked, while the women–who deliver alternating monologues–appear each time in a more elaborate, more dramatic but also insane costume: fantasias of beads and fringe and the detritus of consumer culture, ever more intricate but also constantly revealing their breasts or buttocks or other normally covered, sexually charged parts of anatomy. For a long time, the men don’t speak; they lie like the corpses of Antigone’s brothers (whose names get assigned to zoo monkeys here), constantly visible but possibly dead. As the play evolves, the men come to life and speak, sometimes sing. The overall shape shifts from single monologue to intercut chorale, some of it drawn (or purportedly drawn) from other sources: emails, news stories. The characters put on and take off a series of uniforms that evoke a modern military, a Communist cadre, and a Catholic schoolgirl all at once. Even without the language barrier, I might have found the show oblique, sometimes circular or repetitive in its logic. But it’s got enormous power and vigor–and burning conviction from all of its performers, especially the three women (Daysi Forcades, Clara González, Linnet Hernández), all of whom inhabit their bodies with a kind of fierce poise that seems to channel a lifetime of anger into a beam of focused energy. It’s sometimes elliptical, but never less than fully committed to showing its performers’ rage against the systems that enmesh and oppress them. Which, in a company that’s spent more than twenty years navigating the tricky waters of producing political art in Cuba, is no small accomplishment. Antigonón, un Contingente Épico runs to January 14 in Under the Radar. More production info can be found here.